Place pineapple, lime juice and salt in blender or food processor with just a splash of the 1/2 cup water. You do not want to dilute the pineapple flavor. Blend until smooth and strain. 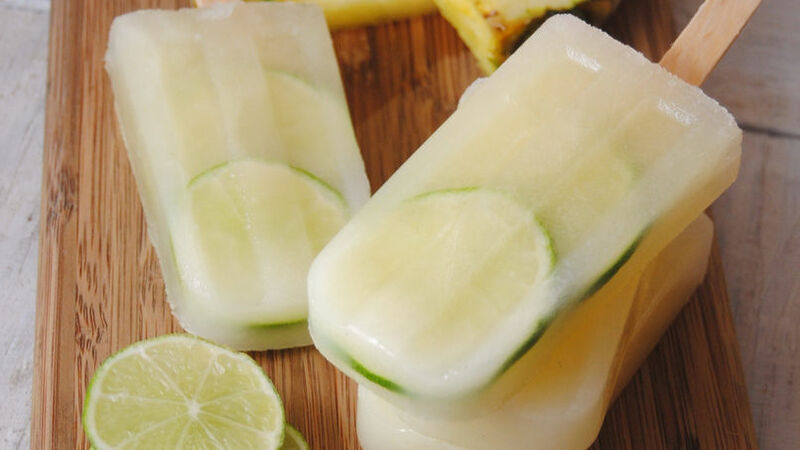 Pour fresh pineapple juice into your paleta mold, insert slices of lime and freeze for about 1 hour. Insert Popsicle sticks and freeze until solid, about 3 hours. To release paletas run your mold under warm water. *Try soaking your wooden popsicle stick in warm water 20 minutes before using. This helps the stick to stay in place. Fresh pineapple is blended until smooth with a touch of lime for a perk of citrus. Freeze until set and enjoy with summer friends. Summer time means one thing Paletas! A Mexican treat widely popular for fighting off the summer heat. Popular flavors include coconut, tamarind, mango, and watermelon and arroz con leche. Vivid in color, bursting with flavor and endless fruit combinations paletas offer a sweet taste of summer. A refreshing guilt free snack, paletas are the perfect summer time treat! Pineapple and lime is all you need to make these mouth-watering candies - perfect dessert for a bunch.